From 16 to 17 March 2017, China Association forStandardization (CAS) held its first workshop on European Standardization in Chengdu. Seconded EuropeanStandardization Expert in China (SESEC) was invited as the keynote speaker to attend the seminar. In the meeting, Dr. Betty Xu，directorof SESEC， and Ms. Mandy Luo elaborated on the European Standardization system, including inter alia, bird’s eye view on the European standardization system, shaping of European standards,European standard supporting EU policy and legislation, European standards supporting international trade, coordination between EU and international standardization organizations, ETSI’s experience on standard drafting,as well as European patents and IPR. 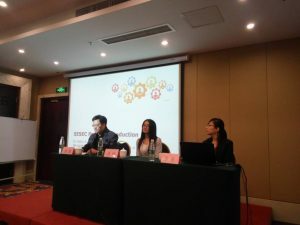 More than 110 participants from various enterprises,associations, organizations in relevant industries took part in the seminar,and had an in-depth communication and discussion with SESEC. They thought the seminar provided them a window to learn about European standardization system, consider more similar activities should be convened in the future, and were looking forward to keeping close and sustained communication and cooperation with SESEC.